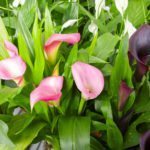 I have been given a calla lily as an indoor houseplant but would like to move it to a sunny location in my backyard before summer. How can I best accomplish this? Thank you!